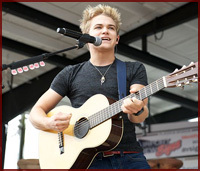 Hunter Easton Hayes has been singing country music since 2000. His self-titled album debuted in October 2011. His album hit the Top 20 with singles "Storm Warning", "Wanted" and "Somebody's Heartbreak". The 2013 re-issue saw "I Want Crazy" hit the Top 5. Don't miss your chance to see this rising star.